One of the highlights of 2013 was the publication of Michael Haas' Forbidden Music. While working as a producer for Decca Haas was responsible for the invaluable Entartete Musik series which provided a retrospective of composers and works banned by the Nazis; at the foot of this post is the CD of music by Berthold Goldschmidt from that series. Haas is currently research director of the Jewish Music Institute for Suppressed Music, based at the School of African and Oriental Studies of the University of London and is also chief executive of Coralfox, a classical music consultancy and production company. In Forbidden Music, which almost certainly will become the standard reference work on the subject, Haas looks at the Jewish composers and musicians banned by the Third Reich for being 'degenerate', and the consequences for music throughout the 20th century. With a subtitle of The Jewish composers banned by the Nazis it is quite clear what the agenda of this meticulously researched and argued book is, and from the opening sentence with its quote from Hans Sach's celebrated monologue on German art, Forbidden Music concerns itself solely with one genre of suppressed music. 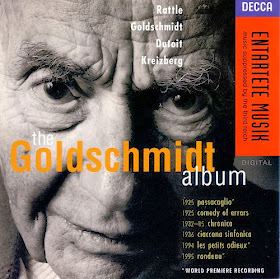 Given the scope and importance of Entartete Musik, that single-mindedness is quite understandable. But, on the other hand, this failure to even recognise the existence of a huge corpus of forbidden music outside Nazi Germany brings the risk of mono-culturalism. In orders of magnitude, the genocide of the Jews by the Third Reich ranks as one of the greatest humanitarian atrocities in history, and the music suppressed by the Nazis is of major artistic importance. But there are many other less well-known examples of persecution and suppression which must not be forgotten, some of which involved Jews. For instance, in the 15th century the multicultural idyll of al-Andalus was destroyed when the Catholic monarchs Ferdinand and Isabella expelled the Jews and Moors from Spain. 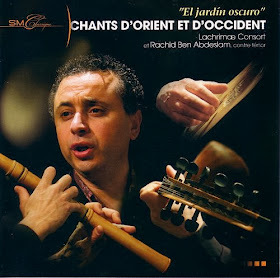 Jordi Savall has been a major force in rehabilitating the music of the Sephardic Jews, but featured below is another fine CD which celebrates the forbidden music of these exiles: on it the young Moroccan counter tenor Rachid Ben Abdeslam and the Lachrimae Consort celebrate music from El jardin oscuro. Two centuries before the Jews and Moors were driven out of Spain, the Cathars had been exterminated by the Albigensian Crusade of the Catholic Church in neighbouring Languedoc. An estimated 10,000 men, women and children were massacred in the town of Béziers alone and, such was the effectiveness of Pope Innocent III's final solution, that none of the forbidden music of the Cathars survives. 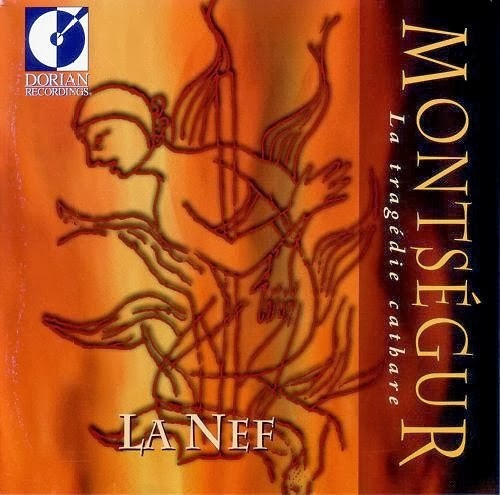 Jordi Savall is again at the forefront of reviving suppressed music with his commemoration of the Albigensian Crusade in his Forgotten Kingdom book/CD project, but attention also needs to be drawn to the speculative recreation of Cathar music on the CD seen above. 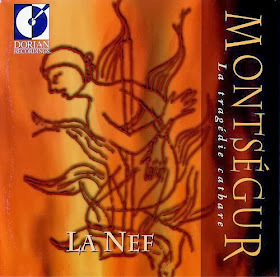 On Montsegur: La Tragédie Cathare the Québecian early music group La Nef re-imagine Cathar music and reflect the parallels with Eastern traditions in the Cathar's beliefs with their use of oud and Egyptian percussion. One of the worst human and cultural genocides in history was triggered by the 1959 Chinese invasion of Tibet. The 14th Dalai Lama estimates that 1.2 million Tibetans have died as a result of the Chinese occupation and more than six thousand monasteries and shrines have been destroyed, and under Chinese rule religious practice including scared music was banned until 1979. (The prevalent double-standards in classical music mean that those who protest loudly about the lamentable human rights situation in Russia remain inexplicably silent about China's infinitely worse record). In the 13th century the Albigensian Crusage extinguished Cathar culture, but, fortunately, Tibetan Buddhism with its sacred music has survived in exile in India. One of the major monasteries in exile is that of Tashi Lhunpo, which is now located in Karnataka in southern India. We are fortunate that the Tashi Lhunpo monks have made several outstanding recordings of what the Chinese consider degenerate music; their CD of sacred music depicting the Buddhist journey of consciousness through Bardo, the intermediate period between death and rebirth, is seen below. The recordings by the Tashi Lhunpo monks, which are released by the Tashi Lhunpo UK Trust, are made on location in India and are notable for their impressive sound. Also available are Tashi ringtones offering "enlightenment for smartphones". 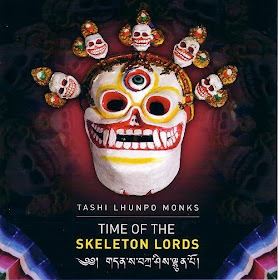 There is also a CD from OgreOgress, a label which supports projects benefiting Tibetans in exile, of sacred Tibetan instrumental music performed by the Tashi Lhunpo monks. This recording was made in the reverberant acoustic of the Basilica of Saint Adalbert in Grand Rapids, Michigan, and the sound of the dungchen (Tibetan longhorns) is the ultimate test for the bass response of an audio system. The limited edition OgreOgress disc was released to publicise the plight of the head of the Tashi Lhunpo monastery and second most important Tibetan spiritual leader, the Panchen Lama. The 11th Panchen Lama was born in 1989 and, after being identified as a reincarnation by the Dalai Lama, disappeared in suspicious circumstances in 1995. In 1996 the Chinese government confirmed that the seven year old was being held in "protective custody", making him the youngest political prisoner in history. To this day the whereabouts or condition of the Panchen Lama remain unknown. Under a widely accepted but still disputed interpretation of the Qur'an all music is forbidden music, but despite this, music and dance has remained central to the mystical Islamic practice of Sufism. However, in an attempt to secularise and Westernize, a law was passed by the newly established Turkish state in 1925 prohibiting Sufi sacred ceremonies (tariqa) at which music and dance were performed. This prohibition meant the closing of the traditional dervish lodges (tekkes) where Sufi brotherhoods met, but Sufism continued in Turkey as an underground tradition. In 1950 a temporary softening in the Turkish government's stance triggered the revival of Sufi music and dance as practised by the Mevlevi (followers of Rumi) and other brotherhoods. But this revival positioned Sufi music and dance as a folkloric rather than religious tradition, with the Whirling Dervishes established as the Cirque du Soleil of the mystical world. 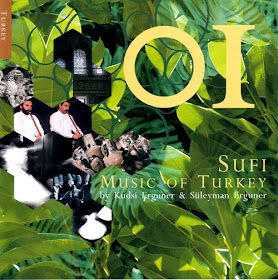 Kudsi Erguner is one of the Turkish musicians who has worked to keep Sufi music away from the dead hand of the entertainment industry. He performs Sufi music on the traditional ney reed flute as a vibrant and dynamic art form and his acclaimed collaborations include working with theatre director Peter Brook and world music pioneer Peter Gabriel. Below is one of many CDs that he has recorded. Forbidden music is a broad church - in more ways than one. Both Thomas Tallis and William Byrd were un-reformed Catholics in 16th century England when those celebrating the Roman Rite were being persecuted, and works such as Tallis' Lamentations Of Jeremiah are thought to have been composed for covert private performance. By contrast, at the same time in Catholic France clandestine 'wilderness assemblies' of Protestants in the Cévennes were singing the Huguenot Psalter to music by composers such as Jan Pieterszoon Sweelink. More recently Bach became forbidden music whan Pau Casals refused to perform in his native Spain following the victory of Franco's fascist forces in the Spanish Civil War; instead Casals performed his beloved Bach at the Prades festival just across the French border. In 1971 John Joubert's Second Symphony, which commemorates the Sharpeville massacre, was banned in South Africa by the government controlled South African Broadcasting Corporation and the order forbidding performances was only lifted following the intervention of Nelson Mandela twenty years later. During the Greek military junta from 1969 to 1974 the music of Mikis Theodorakis was banned. 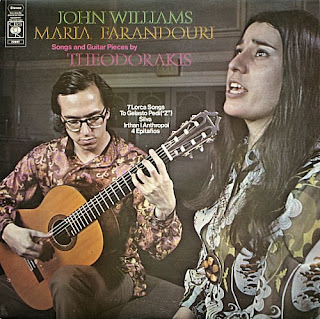 On the LP seen below Maria Farandouri accompanied by John Williams sings Theodorakis’ To Yelasto Pedi from the soundtrack of the legendary 1969 film Z, a film that became an international symbol of opposition to the Greek military junta. Almost all the preceeding examples are of music forbidden by authoritarian regimes. But music can also be forbidden in democracies. In 1949 William Grant Still's opera Troubled Island became the first major opera composed by an African-American to be presented on an American stage when it was premiered by New York City Opera. At its opening night the opera received twenty-two curtain calls from a sold-out house and was judged a resounding success by those present. But press reviews were perversely negative and the production closed after three performances, effectively making Troubled Island forbidden music. William Grant Still's opera was, allegedly, victim of racial and political intrigue within the classical music establishment. But intrigues of a different kind look likely to define forbidden music in the future, with the hegemony of Amazon and iTunes and the associated death of bricks and mortar music retailing meaning that control of the availability of recorded music is now in the hands of a self-interested commercial nexus. Despite promises of a digital long tail, you will have considerable difficulty buying* the CD from Rachid Ben Abdeslam seen at the head of this post. This despite the disc winning awards, despite a 2012 release date, and despite Rachid Ben Abdeslam making his Metropolitan Opera New York debut in 2013 singing Abdeslam in Handel's Giulio Cesare, a performance praised by Anthony Tommasini as having "vocal sheen". For reasons unknown the highly recommended El jardin oscuro, which is released on the small French independent ADF-Studio SM label, failed to achieve international distribution, and as a result has become an example of 21st century forbidden music. Michael Haas' book and his recordings documenting Entartete Musik represent musical scholarship at its very best. But our world view is widening and we now need to widen the definition of forbidden music. Is there a record company and a book publisher courageous enough to commission a Forbidden Music of the World project? * My copy of El jardin oscuro was found in the shop of the monastery of Sainte-Madeleind du Barroux, a source for several other examples of forbidden music 2.0. Readers unable to make the trip to Le Barroux can buy the CD or a download from the ADF-Bayard website which is in French. Michael Haas' Forbidden Music was a requested review sample. All CDs/LPs from my personal collection and no other freebies involved. Any copyrighted material on these pages is included as "fair use", for the purpose of study, review or critical analysis only, and will be removed at the request of copyright owner(s). Also on Facebook and Twitter. This is a brilliant roundup of banned and persecuted music spanning centuries, and yet I was surprised (pleasantly) by the inclusion of William Grant Still and his opera Troubled Island. With so much injustice employed in the music business throughout history (reaching back to before it was really a business) the palpable tragedy of Still's story has yet to reach the mainstream, much as his nine operas still lie sleeping, awaiting premieres and major productions. Thank for including Still, and providing a platform for all those who have been deemed entartete. http://www.suntimes.com/entertainment/stage/23262563-421/overdue-chicago-premiere-of-troubled-island-a-triumph.html — and at the end of the year placed it at the head of his list of the events of 2013. All of which seems to confirm that the opera was victim of racial and political intrigue within the classical music establishment.